- second, the lack of an official website. 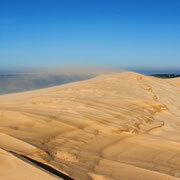 The Dune of Pilat is the most visited tourist attraction of southwestern France. Because of its reputation far beyond the French borders, it attracts each year a large number of visitors from around the world. 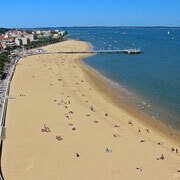 The proximity to Bordeaux, a UNESCO World Heritage Site since 2007, to the most famous wine region in the world, but also to the long sandy beaches on the Atlantic coast play certainly an important role in this. 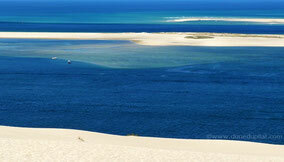 dunedupilat.com aims to introduce this extraordinary dune to all tourists and nature lovers and is to provide interesting and useful information. More and more people are planning their holidays on the internet and even use their smartphones at any time to get information on their destination. Thus, a website about the dune seems useful and practical. It has also been important to me to make the information available to as many people as possible. Thus, a special feature of this project is undoubtedly the fact that five different language versions are available - in English, German, French, Spanish and Italian. A visit to this attraction should not fail because of the famous "language barrier". This website has been created by the author without any help or support by official organisations. It remains - as well as the dune - always in motion and is continually completed by current and detailed information and even better photos! 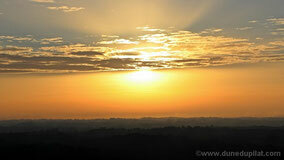 All text, images and other contents are copyrighted. Detlef Bogs is a professional translator living near Bordeaux. He has been working as a freelancer for leading international companies specialized in many different sectors. He translates various kinds of texts such as press releases, agreements, websites, brochures, interviews and scripts to French and German. He speaks English, French, German, Spanish and Italian. 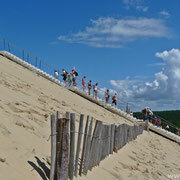 The Dune of Pilat is the most frequently visited tourist attraction in southwestern France. This spectacular dune is unique in France and even in Europe. It is more than just a "pile of sand." It is also the second most visited natural monument of France and a symbol that man has no chance of fighting the forces of nature. It's just the wind and the sea that decide about the progression of this dune. 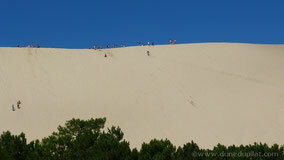 By the way, tourists have the opportunity to visit the dune throughout the year. Elsewhere, exceptional dunes are often difficult to reach or access is even forbidden. 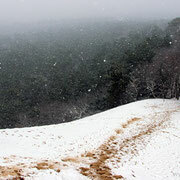 This is one more reason for everyone to contribute to the preservation of the Dune of Pilat and to respect nature. This website aims to give all nature lovers the information they need to understand this dune in particular, or even all the dunes, a little bit better. There is no "official" website for the Dune of Pilat (often spelled Pyla) and even tourist guides sometimes give little information about this really worthwhile destination. A special feature of the site is that the information is provided in five different languages​​. It would be a great pity to miss this jewel of southwestern France’s natural heritage because of the language barrier! This website will be always on the move - just like the dune!